This is part of the history of Arsenal during the time of Henry Norris’ involvement with the club. A full index of the articles so far presented, appears at the foot of this page. The month began with dispiriting news as a night-long German Zeppelin raid on the West Midlands on 1 February resulted in at least 35 dead. It was indeed a new, and for many an incomprehensible form of warfare. On 5 February the second “series” of matches began in the London Combination (details of how this was set up were given in the January commentary). It was a 1-1 draw home draw with Watford. Meanwhile the fruit of Henry Norris’ labours since the outbreak of war were there for all to see. He had recruited, and we must note, and also paid for out of his own money, two artillery brigades, the 177th and 182nd. They had been trained and now were sent to France. Two brigades that would not have existed without Henry Norris. His administrative arrangements for conscription were also now being seen as the model of what local authorities should be doing (but many were not). No wonder his star was now on the rise. On 9 February the Military Services Act Tribunal in Fulham was further expanded with the addition of new members to work under Henry Norris chairmanship. A deputation from Labour groups in Fulham (who were not represented on the council, which was 100% Conservative Party) attended and they presented the point that they hadn’t been consulted when the list of new members of the Tribunal had been drawn up. The leader of the Labour deputation, the trade union activist R M Gentry made the point that the choice of new members should be seen as democratic – and should also include women. Norris and his supporting group did nothing about the objections, which shows, I suspect, a further hardening of his position. It was war, he was following the rules, and he was doing the hard work and he didn’t want anything getting in the way. On 12 February Arsenal played their next London Combination match losing to Brentford, away, in front of a crowd of just 3,000. One week later on Saturday 19 February, two very different issues arose. First the new Tribunal met for the first time at Fulham Town Hall and their first task was to handle cases that were left over from the Group and Canvas scheme in the days before conscripton. One difference however was that the tribunal was now open to the public and the press were allowed in. The Fulham Chronicle published the names of men who stated they were pacifist, which of course led to a lot of local persecution. This process of hearing claims for exemption lasted until 1918. Henry Norris, busy with the Tribunal would of course not have been at the Arsenal match at Highbury on this day, and it was the most tragic of days as this was the day Bob Benson died. Robert William Benson was born in Whitehaven in Cumbria on 9 February 1883. His first club is recorded as Shankhouse of the Northern Alliance, and then Shalwell (a district near Newcastle – but I can find no record of the club). Wikipedia suggests that at the same time he worked as a coal-miner. He signed as a professional for Newcastle in 1902. He played only one game for Newcastle (v Liverpool) and left for Southern League Southampton in 1904 for a fee of £150, playing for the club for the first time on 1 October 1904 in a draw with Brighton. Descriptions of him include “snuffing out [the opposition’s] moves with his sense of anticipation“. He was also given the job of taking penalties, and clearly had a great sense of humour since he apparently adopted the process of running the full length of the pitch before kicking the ball. But unfortunately the joke turned a little sour as he kept missing, and so was relieved of his duty as penalty taker after a while. He played 19 times for Southampton before leaving to move to Sheffield United (then in the First Division) for a fee once again of £150. And this time he did stay – for eight years. He also got his penalty taking sorted for he scored 20 during his time in Yorkshire, playing for them 283 times. And he gained some recognition for his performances for he played on the England tour of South Africa in 1910, as well as gaining a full international cap in February 1913 against Ireland. Beson joined Woolwich Arsenal in November 1913 just four months after the move to the north of the river, playing for the first time away to Bristol City on 29 November 1913. It was a 1-1 draw in front of a crowd of 15,000. He played at left back, but for the final league game of the 1914-15 season he played at centre forward with HE King moving to number 8 in a patchwork end-of-season game. He scored twice in the 7-0 win at Highbury. 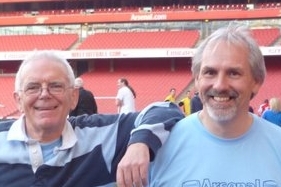 For his part in supporting the country’s war effort Bob Benson went to work at the Royal Arsenal, but on 19 February he went to the London Combination match between Arsenal and Reading at Highbury. Joe Shaw did not make it to the game (I am not sure of the reason) and Benson either volunteered or was persuaded to take his place, although he had not been playing since that match against Forest, 18 months before. It is said he had not stayed in training during these 18 months, and as a result, or perhaps as a result of this and another medical condition, he collapsed on the pitch in the second half and died in the changing rooms a little later of a burst blood vessel. He was just 33. It is said he was buried wearing his Arsenal shirt, and a testimonial was held for him against the Rest of London at the end of the season. 5000 turned up and the proceeds went to his widow. He had played 54 first class games for Arsenal over the two second division seasons. However as always, and no matter what the tragedy, football continued, and Arsenal played again the following Saturday securing a 4-1 home win against Reading. On Wednesday 23 February Henry Norris, acting on this day as mayor, went to a reception at Kelvedon Hall organised by the local Roman Catholic priest, Rev J Crowley, undoubtedly part of the church’s drive to show that despite what was happening in Ireland the church was standing alongside the rest of the country in the war effort. The following evening Norris attended an annual dinner of one of the wards in his Borough, and made a speech in which he suggested that once the war was won, Britain should have no trading relations with Germany. He was obviously engaging in some creative thinking at this time, perhaps because his work had diminished a little now that his work in attempting to drive up recruitment had come to an end (with the introduction of conscription), for a couple of days later the Fulham Chronicle published a letter from him suggesting that shops should regularly close earlier than in peace time. Although this was to save electricity, it was promoted as a way of improving the health of shop keepers. The month’s football was wound up on 26 February with a 1-1 draw away to Clapton Orient. It was Andy Ducat’s last game for Arsenal in the season, being on line (occasionally) from Aston Villa. The game also saw an appearance from Caddick of Bristol Rovers. Here is the table of games for the month.